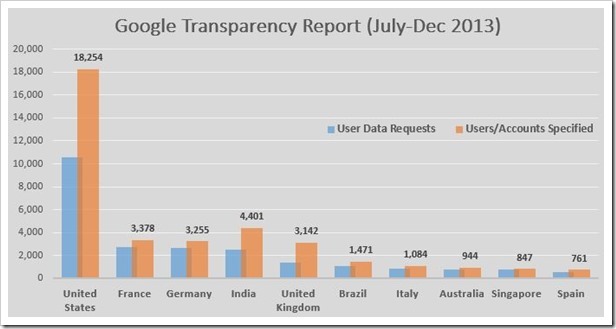 Google has released their six monthly Transparency Report and according to it, Indian Government made 2513 data requests that requested information on 4401 Users/Accounts in the period between July 2013 to Dec 2013. This is second highest among all the nations after the USA. For all the requests that were made, Google complied to 66 percent of them furnishing some kind of data. 4401 Users or Account requests was the highest number since Google started publishing Transparency report since July 2009. During first half of last year, Indian Government had made 2691 data requests that requested information on 4161 Users or Accounts. USA remains the top country when it comes to number of data requests made by the Government agencies. They made 10,574 user data requests requesting information on 18254 accounts and Google complied with over 83% of those requests, again highest among all the nations. France (3378) and Germany (3255) were behind US and India in terms Users/Accounts information requests. Between July-Dec 2013, various government agencies across the world made a total of 27477 user data were made for over 42648 user account information. 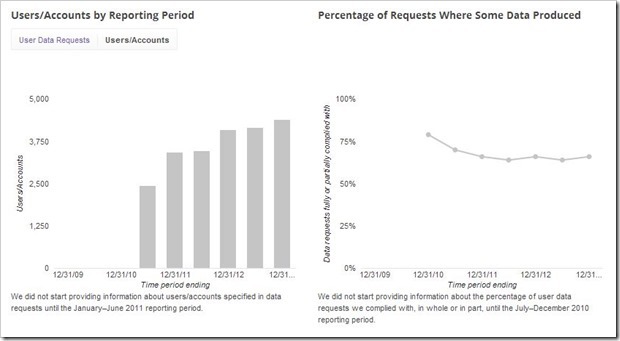 At a global level Google complied with 64% of all the requests made with some kind of data. India has slightly higher compliance rate of 66%. Among the Top 10 countries with user requests, Google provided back 83% of data to agencies for the USA, followed by Australia (70%), United Kingdom (69%), Singapore (68%) and India (66%). Google was the first online company to start offering transparency report back in 2009. Over last 3-4 years nearly every major online company including Facebook, Twitter, Microsoft and Yahoo have come out with their transparency reports. Transparency reports are obviously great way in which normal users can know how much data is being shared with Government without their knowledge. Indian Companies Invested $17B In USA, Generated 81000 Jobs!